Originally called Charles Town for early settler Charles Sallier, then renamed Charleston, the city today known as Lake Charles, Louisiana, was incorporated as such in 1867. Its early economy was based on the timber business, but after World War II, Lake Charles developed as a center of petrochemical industry. Located in Calcasieu Parish in southwest Louisiana, Lake Charles has had an active Jewish community for over a century. Leopold Kaufman was among the first Jews to settle in Lake Charles. In 1879, the Alsatian Kaufman arrived in Lake Charles with his business partner, David Block. The two soon opened a general merchandise store in this small town of 500 people. In a village the size of Lake Charles, Kaufman gained a reputation as a savvy businessman and important citizen. He was the principal organizer of the First National Bank of Lake Charles. Within a few years, the Jewish community grew, and Kaufman became a leader among his co-religionists as well. Kaufman was instrumental in bringing Jews from Alsace to Lake Charles; he was the founder and first president of the Lake Charles Hebrew Association, the precursor to Lake Charles’ Jewish congregation. Another early Jewish resident was David Reims, a butcher who arrived in Lake Charles by way of New Orleans. 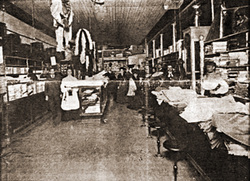 Julius Frank opened the first store in Lake Charles to deal exclusively in furniture. Adolph Meyer owned a drugstore, and got involved in local politics, serving as mayor of Lake Charles from 1874 to 1888. Perhaps the most prominent and successful of these early Jewish settlers was Julie Kaufman Muller. Julie Kaufman was born in 1853 in Alsace to Jacob Kaufman and Helene Levy. In 1870, fear of the impending Franco-Prussian War led Julie and her brother Joseph to immigrate to the United States. After arriving in New Orleans in April 1870, Julie and her brother settled in Donaldsonville, Louisiana, where she met, married and had two children (Maurice and Dora) with fellow Alsatian Isidore Muller. Isidore soon passed away. The now Mrs. Julie Kaufman Muller worked as a dressmaker in New Orleans for three years before joining her cousin Leopold Kaufman in Lake Charles in 1882. The small village, replete with farms, buggies and sawmills was a far cry from the bustle of New Orleans; Julie herself even considered Lake Charles “a struggling village, where men and cattle often shared the same streets and walks,” but she preferred to raise a family there. It was in this small village that Julie found her niche as a dressmaker. In her dress and millinery shop, a small room in a tiny wooden building, Julie found local fame and relative fortune with her designs. Rather quickly, a humble one-room sewing venture was transformed into a behemoth business; Muller’s Department Store was born. Muller’s was not only the center of economic activity and social interaction in downtown Lake Charles, but also the major retailer between New Orleans and Houston. As her business flourished, she married Simon Marx, who managed her store for a decade. The couple had three children: Adolph, Sophie and Helen. Sadly, Julie’s second marriage ended like the first, in early widowhood. Simon Marx died only eight years later, at the age of 35; the local newspaper called him a “bright and successful young businessman.” Julie placed her eldest son, Maurice Muller, in charge of Muller Co. In addition to running the family store, Maurice Muller was active in the Masonic Order, served as vice president of Calcasieu National Bank, and served as the director of the Chamber of Commerce. His mother was also involved in the community—as a member of the synagogue’s Sisterhood and as a member of the Order of Eastern Star (Ruth Chapter no. 16). In 1924, at the age of 70, the pioneer businesswoman passed away. With the death of his mother, Adolph Marx, a former second lieutenant during World War I, took over as manager of Muller’s until his retirement in 1964. After the growth of the economy during World War II, Muller’s expanded by buying the furniture store next door, Berdon-Campbell. During the 1950s, Muller’s reached its peak, employing over 100 people. In the late 1960s a more difficult era for Muller’s began, as migration to the suburbs seemed to doom downtown Lake Charles. Muller’s fate was further sealed in 1972, when the opening of the Prien Lake Mall created unprecedented competition for the department store. In 1975, Muller’s opened a smaller store in Prien Lake Mall; in 1980 a small store was opened in DeRidder. In 1985, the fateful day arrived: Muller’s closed. The building sat idle until 1995, when the space was donated to the Police Jury. A decade later, the Policy Jury sold the building to Roger Landry, who planned a multipurpose commercial and residential facility for Lake Charles’ downtown. If Julie Kaufman Muller and her descendants shaped the commercial economy in Lake Charles, Rosa Hart was central to the city’s cultural development. Born in Woodville, Mississippi, in 1900, Hart grew up in Lake Charles before graduating from Newcombe College in 1921, where she became America’s first female cheerleader. After college, she tried her luck in New York City, but lasted less than a year before returning to Lake Charles. To support her passion for the arts, Hart worked in a number of ventures, including teaching high school, selling insurance, and doing publicity for a movie booking company. 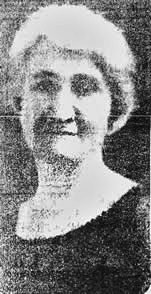 She founded the Lake Charles Little Theater in 1927 and served as its unpaid director for the next thirty years. 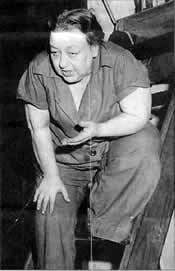 In 1948, Life Magazine did an eight page story on Hart and the community theater as it rehearsed the play “The Great Big Doorstep.” In 1957, she had to retire from the theater due to poor health, and passed away seven years later. Known as a stubborn free spirit who could be tough on her actors, Hart is still remembered for her impact on theater in Lake Charles. The Little Theater remains active today. In recognition of Rosa Hart’s contributions, the city’s downtown performing arts theater was named after her. While Lake Charles Jews made a lasting mark on their city, they also worked to preserve their own religious traditions. On September 15, 1894, 17 men formed the Lake Charles Hebrew Association, including: Leopold Kaufman, Isaac Reinauer, Solomon Bloch, Nathan Solomon, Julius Frank, David Reims, Samuel Kaufman, Moise Marx, Joe Rothchild, Solomon Marx, Louis Hirch, Michel Hirch, Louis Craiger, R. Rosenthal, Alex Hymes, W.H. Wolfson, and Achelle Yandel. With an association formed, the small Jewish population of Lake Charles began to hold services. At first, they worshiped at Enterprise Hall. After a year, the Hebrew Association held services, like other small towns with no synagogue, in the local Masonic Temple. After a decade of wandering, the Jews of Lake Charles finally built a permanent home, a Byzantine synagogue with the Ten Commandments in front, completed and dedicated on November 20, 1904. In attendance at the ceremony were Rabbi Isidor Warsaw of Lake Charles, Rabbi J. Friedland of Beaumont, and Rabbi M. Jacobson of Shreveport. The first officers of Temple Sinai included Leopold Kaufman as president, German-born proprietor of I. Reinauer and Son’s Clothing Store Issac Reinauer as vice president, Alsatian broker Solomon Bloch, and fellow Alsatian liquor store owner Nathan Solomon. The Reform temple’s first rabbi was Isidor Warsaw, a recent Hebrew Union College graduate who served the congregation from 1904-1906. In 1907, the congregation was officially chartered as Temple Sinai. In June 1907, the synagogue renewed its charter, adopting the Minhag America; signatories included Leopold Kaufman, Louis and Saul Reinauer, and Julie Marx. Though the entire Jewish population of Lake Charles was only 125 people, there were 40 strong members of the temple, which conducted services in English on Shabbat and holidays. The community also boasted a religious school of 25 children. In 1908, Temple Sinai officially joined the Reform Movement, affiliating with the Union of American Hebrew Congregations. The Temple Sisterhood, first called the Ladies Aid Society, was organized in 1916, and among the 28 original members was Julie Marx. One of the most memorable achievements of the Sisterhood was their purchase of the synagogue’s pipe organ, the first ever installed in a house of worship in Lake Charles. Lake Charles women also founded a chapter of the National Council of Jewish Women, which focused on helping the larger community. Working on both charitable and cultural projects, the local NCJW chapter founded a Sick Loan Shelf, volunteered at St. Patrick Hospital, established a foreign film series, and helped to start a pilot French language program in the local schools. By 1919, the Jewish population of Lake Charles had grown to 286 people. Under Rabbi Joshua Bloch, the services in Temple Sinai were conducted in Hebrew and English; the religious school enrolled 27 students. As the community grew, Temple Sinai’s synagogue expanded with it. The first change to the temple came in 1918, when a storm destroyed the onion domes atop the synagogue. After Leopold Kaufman donated the necessary land, the synagogue was expanded in 1929. In 1947, interior renovations were undertaken; the religious school addition was completed in 1960. By 1940, the congregation lacked a full-time rabbi, and E.R. Kaufman, son of Leopold, served as acting rabbi, though he was not officially ordained. At the time, there were about 20 Jewish families in the city, numbering approximately 100 total Jews. For a time, the local B’nai B’rith chapter, which had been established in 1900 by Maurice Muller, had more dues-paying members than Temple Sinai. During the 1950s, though, the congregation stabilized, as it attracted a coterie of doctors, lawyers and other professionals. Among the new arrivals in Lake Charles was the Kushner family. William Kushner came to Lake Charles to become the conductor of the local symphony. His son, Tony Kushner, is a celebrated playwright who won the Pulitzer Prize for his play “Angels in America.” His award-winning musical, “Caroline, or Change,” was based on his experience growing up in Lake Charles. ​In the 1960s, the Jewish community began to decline. As people moved away or died, the congregation dwindled. By the end of the 20th century, the temple began to have trouble affording a full-time rabbi, a problem that continues. The congregation has been served by part-time rabbis since. Still, the congregation persists, as the Jewish families of Lake Charles continue to preserve their Jewish heritage in southeastern Louisiana.